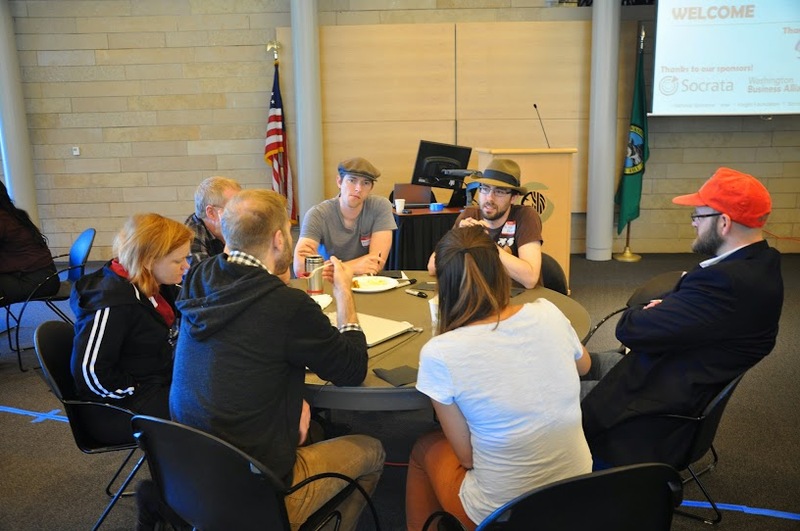 On May 31 Open Seattle participated in the National Day of Civic Hacking with the local event Hack for Change Seattle. About 60 participants worked on 10 projects ranging from air quality visualizations to hacking bicycle & pedestrian counters. We’ve all experienced the rush and excitement of building an app over a weekend, and the lack of resources and motivation to continue the project afterward. How do we sustain momentum? And for projects that are reusable or that could be offered as services, how do we turn our one-off projects into businesses? Read a text version of his talk and check out the slides on Andrew’s blog post National Day of Civic Hacking; My View From Seattle. 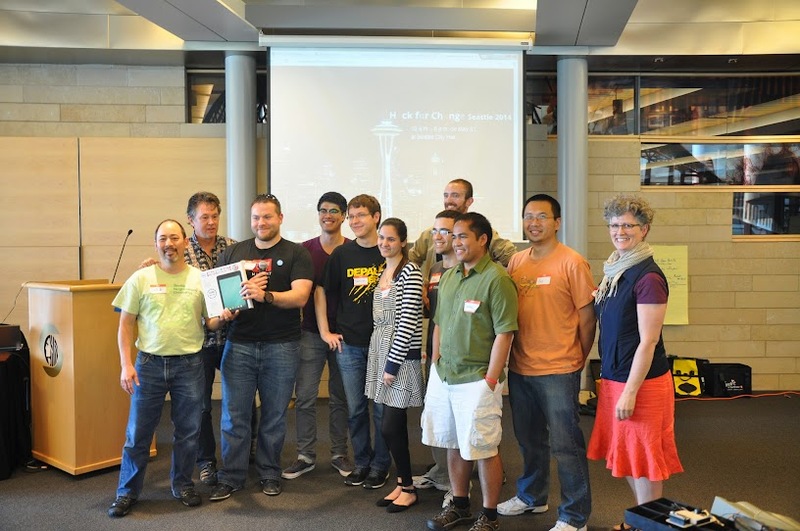 Thanks to all who made Hack for Change Seattle happen! Thanks to the local and national sponsors that contributed to making the National Day of Civic Hacking awesome! The Seattle event couldn’t have happened without the space at City Hall generously provided by the City of Seattle. Socrata, Code for America, and the Washington Business Alliance all contributed to provide the Mighty-O donuts and lunch from La Bodega. 10 projects were actively worked on throughout the day! We are all affected by air quality and, at times, should limit our exposure to the outdoors to avoid air conditions which may be hazardous to our health; however, air quality information is not readily available to the public or developers. Fortunately, good air quality information is available through the EPA for many locations within the Untied States, Canada, and other locales; however, although this data is available it is not very accessible at the moment. The data can be accessed in bulk format via a CSV file and through rigid RESTful APIs accessible only with authentication. The goal of this project was to collect the air quality information and create a more responsive API around it, along with front-end visualizations. Richard Barnes and Rebecca Fink worked on this project, successfully completing a frontend visualization and making good progress on a backend API. If you’re trying to make decisions about urban development, you need to know who’s already using the space. For Seattle Neighborhood Greenways, that means knowing what pedestrian and bicycle traffic is like in an area, so they can determine the usefulness of creating a greenway on a street. Led by Bob Edmiston, the largest project at the event was developed by three teams: a hardware team that worked on the actual sensor that counts people as the pass, a web team that created a simple visualization of the count data in real time, and a camera team that built a tool that captures pictures of passersby as they trigger the sensor, to help validate the count. Working to create a “data portal” for homelessness data, visualizations and analysis, this project got started at Hack to End Homelessness. The team was looking for correlations in data but found they didn’t have the data they needed. Over the day they experimented with tools, data visualizations, and ironing out the data models. OneBusAway is great. You might have noticed that there are a couple of bus stops that have screens showing bus arrivals. These are cheap, and there should be more of them! 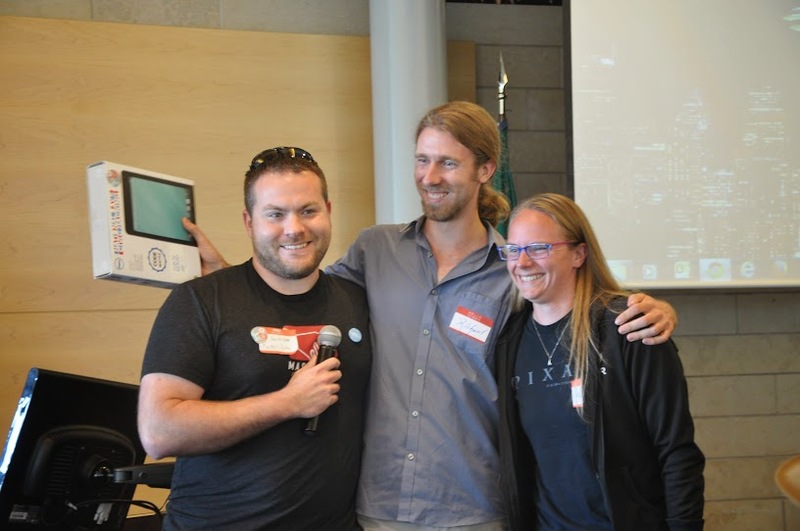 Led by Will Scott, the OneBusHome team worked on a disk image that can be loaded on a raspberry pi or similar embedded device to leave in the windows of businesses in front of high traffic bus stops. Goals for today are scripts to have a stable UI that loads on boot, and working on how to do auto-update & network configuration. They went from having an idea to having some code written (local scripts), and are interested in getting more volunteers: coders, designers, hardware people. The Duwamish River is Seattle’s only river and is one of the most polluted urban waterways in America. The river contains more than 40 different contaminants that are identified as being above the safe limits for humans and the environment, including PCBs, dioxin, carcinogenic PAHs, and arsenic. The contamination has also spread to the rest of Puget Sound, negatively affecting wildlife across the entire oceanic food chain (orcas, sea lions, plankton). In 2001, The Duwamish River was declared a “Superfund” site from the US Environmental Protection Agency. After 13 years of political deliberation, a cleanup effort has been underway, but there are many important questions about who will be doing the cleanup, how the cleanup will take place, how much it will cost, and how effective it will be for future generations. The Smarter Cleanup team worked on a map that shows what’s happening with the cleanup in real time, people can report their observations, attach photos, draw polygons, etc. Seattle neighbohoods need a community forum where open inclusive community comes first, and it needs to be based on a platform that’s easy for any community to use and something people would be confident enough in to commit volunteer time and money to. Most community organization currently takes place in email lists or on Facebook or Next Door. Email lists are easy to setup and very portable (you can always move the emails somewhere else) but they aren’t very robust (or fun) and can be overwhelming for many people. They also don’t have a lot of community-centric features. Facebook and Next Door are very popular and their platforms are obviously built around community but they aren’t very open, you’re dependant on their whims (like when Facebook changed the Pages algorithm) and if something shuts down (like Everyblock did) you are out of luck with all your members trapped in their systems. All that work you put into your community is gone. The neighborhood community forum team worked to change that. Led by Phillip Dugan, the team defined project scope and requirements and researched existing community forums. They gathered helpful feedback from hackathon attendees on what is feasible and what is needed for a good neighborhood forum that will inform their decisions as they continue work on the project. Open Data: What’s The Right Stuff? Led by Matt Rosenberg from the Washington Business Alliance, the team created a list of suggestions of what specific data all governments should be making available, with the goal of establishing common standards for open data (focusing on things not being covered broadly or at all), guidelines for how to provide the right kind of open data in a more navigable way. The team welcomes further collaboration on this project, and encourage everyone to request access to their Google doc and make additions. You need something to do, you want to volunteer and make on impact on your community, but you have no idea how to get started. ActivateHub is designed to solve that problem. 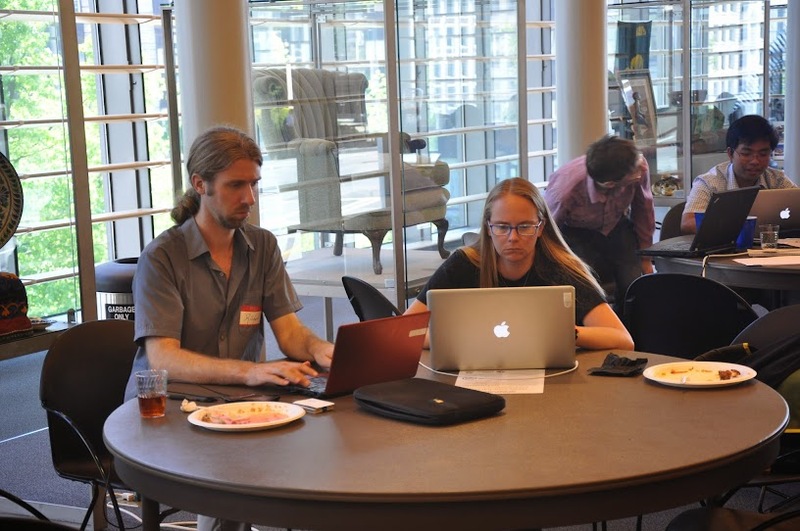 Led by Lindsay Caron Epstein, the team worked on improving the coding environment to enable a more nimble entry process for new open source contributors. The OpenStreetMap team got two new volunteers set up and mapping. At the end of the day Rex St. John, representing Mashery and Intel’s Code for Good program gave out two tablets to teams that fit Intel’s Code for Good award – best solution to a civic problem using open data, local/personal data, and/or hardware, and their Urban Innovation award – most novel use of urban space (public, shared workspace, technology, infrastructure) to reinvent urban development. The code for good award went to the Air Quality API & Display team. The urban innovation award went to the Hacking Pedestrian and Bicycle counters team. This post is open source! Spot a typo or need to make additions to your team’s description? Find this post in the GitHub repo for this site. Get updates on projects, upcoming events, and local civic tech news. Please help improve this post. All participants in Open Seattle events and activities, including our Slack group, GitHub issues and other forums, must follow our Code of Conduct. Read it at openseattle.org/conduct. Open Seattle is a multi-disciplinary group working together to improve our communities through civic technology.